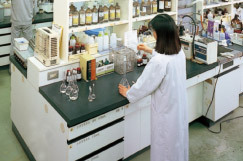 The Quality Department at Fuji Chemical has established a thorough monitoring system for the production and quality control in accordance with the cGMP standards. In order to develop a reliable quality assurance system, our Quality Department consistently updates a GMP system based on the latest GMP guidelines. All employees are involved in constantly improving the manufacturing operation for "contribution to people, future, and society" by delivering high-quality products.